I am thrilled beyond words to announce the sale to CRESTON BOOKS of a new MG historical titled WISHES, DARES, AND HOW TO STAND UP TO A BULLY. Marissa Moss at Creston Books has acquired Notable Social Studies Award winner Darlene Beck-Jacobson’s next middle grade, WISHES, DARES AND HOW TO STAND UP TO A BULLY. This novel in verse crystallizes a boy’s worries about his father, who is MIA in Vietnam, and how his family, new best-friend, and a bully unexpectedly help him find the courage to do the right thing, not just the easy thing. Publication is slated for Spring 2020; Liza Fleissig at Liza Royce Agency negotiated the deal for world rights. Eleven year old Jack misses his Dad who is MIA in Vietnam. It’s been months since he and his family had word of his whereabouts. The last thing Jack wants to do is spend summer with his grandparents. Mom believes it will be good for them all – Jack, his sister Katy, Mom, Gran and Pops – to be together while they wait for word about Dad. Keeping busy will keep them out of trouble and help them think of other things. Jack expects the worst summer of his life. The first summer without. Without Dad, without friends, without his room and all the things that remind him of Dad. When Jack meets a girl named Jill – a girl with a brother who makes trouble for both of them – things they believe are turned upside down. Welcome to a summer of fishing, camping, bullies, and a fish who grants wishes. A fish that could be the answer to Jack’s problem. But when Jill makes wishes of her own, things don’t turn out the way they expected. Every wish has a consequence. Will the fish grant Jack’s biggest wish? Will Jack be brave enough to ask? PB Author Vivian Kirkfield Presents:Unsolved Mysteries: Three Questions About Sarah E. Goode. When I decided to write a nonfiction picture book story about Sarah E. Goode, I had no idea how difficult it would be to find information about her. I mean, you’d think, a person who was one of the first African American women to receive a U.S. patent would have a lot written about her, right? Especially since she’d been a slave when she was a child. Just think about that…from owned to ownership. Those words actually spurred me on as I dug deeper, trying to unearth more information. Wow! Your author seems to have amassed much more information than we ever dreamed there would be. We have nothing in our files on Goode and her name only comes up every Black History Month when some unlucky child has her name assigned for a report. All we’ve ever been able to lead them to is a photo of the patent and a brief blurb in a “Black Inventors” book. Essentially nothing more than can be found on the internet. When I read her reply, I knew that I had to pursue this story because Sarah had obviously not received the recognition in life or in death that she deserved. She was a trailblazing courageous young woman who could inspire the children of today to build their own dreams. But even though I searched high and low, there were three things I was not able to track down and verify. WHAT DID SARAH LOOK LIKE? Searching around the internet, I found two or three sentences repeated on just about every website that had a bit of information (often untrue) about Sarah E. Goode. Several of the websites had her photo. There is no known photo of Sarah E. Goode. The photo that appears on several websites? I don’t know who it is, but it is definitely not Sarah. Some websites say Toledo, Ohio. Some websites say Toledo, Spain. What? I can totally understand the confusion. On the 1870 Chicago census, Sarah was 15 years old and her parents listed her place of birth as Toledo, Ohio. However, in the 1880 Chicago census, when Sarah is a married woman of 25, she listed her place of birth as Toledo, Spain. From all the research I’ve done, I surmise that Sarah might have been born in Northern Virginia…a slave state in 1855, the year of her birth. The border of Northern Virginia runs along the southern border of Ohio…a free state in 1855. It might have made sense for Sarah’s father, a freeman, to claim that his daughter was born in Ohio where she would be considered free. And, as for Sarah claiming she was born in Toledo, Spain, again, we can only guess. Perhaps she thought if she said Spain, that would grant a bit of the exotic to her existence. I doubt we will ever know the true story. WHAT HAPPENED TO SARAH’S BUSINESS? By 1883, a time when most women didn’t own anything, Sarah owned a furniture store in downtown Chicago. She built the innovative cabinet bed and applied for a patent. A year later, her application was returned – DENIED. Other similar inventions had already been patented. Sarah could have given up. But she didn’t. Carefully she changed a word here and a sentence there, explaining more about her unique mechanism, the idea that had come to her so long ago. Slipping the paperwork and a bit of her heart into the envelope, Sarah sealed her fate and sent it off. A year later, on July 14, 1885, Sarah’s patent was granted. In 1886, her business appears in Chicago’s city listing. But sadly, by May of 1887, an advertisement in the Chicago Daily Inter-Ocean newspaper shows another vendor selling cabinet beds that look just like Sarah’s. “Manufacturer of these beds went bust and we are now the exclusive distributors.” We may never know why Sarah lost her business – illness, bad luck, or jealousy and possibly violence from business competitors—I did discover that her mother and one of her children had died the year before. She had lost two of the people she had loved the most. But there is one thing Sarah will never lose: her place in history. Sarah E. Goode will always be one of the first African American women in U.S. history to be recorded as earning a patent for her invention. And now, the next time young students are given the name of Sarah E. Goode as a Black History Month or Women’s History Month project, there will be a book they can take out from the library, Sweet Dreams, Sarah. 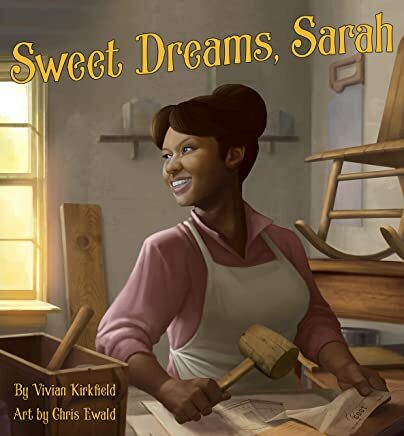 The author’s note, timeline of Sarah’s life and list of African American women patent holders in the back matter add rich STEM content to the book.